One of the easiest ways to make your Roland Park yard a healthy and attractive place for wildlife is to increase the number and variety of native grasses you use. Thankfully, many of our indigenous grasses (and grass-like sedges) are lovely to look at and are also readily available at independent garden centers. Many butterflies, especially banded skippers and satyrs, depend on native grasses as a food source for their young. And many birds will use the seeds in fall or winter. Even fireflies depend on having stands of unmowed grass in the landscape. Fireflies are active at night, and spend their days resting on blades of grass. They are, therefore, very vulnerable to mowing if the only grasses in your yard are turf-grasses. One excellent native grass for Roland Park is Panicum virgatum, or switchgrass. It is a wonderful, clump-forming perennial grass. It grows three to six feet in height, and makes a wonderful accent planting. Because of its robust root system, once established it can do very well in difficult site conditions (e.g. along a sunny, south-facing wall or foundation, even one sheltered from rain). The leaves are usually bright-green when they emerge in late spring, though some cultivars turn more red in summer (‘Shenandoah’ is one of these). Another choice for sunnier sites is Schizachyrium scoparium, or little bluestem. It is highly attractive, especially in fall and winter, and tends to remain somewhat shorter than Panicum virgatum. It prefers sites that are on the dry side (too much water can cause it to flop over instead of remaining erect). We also have several native grasses that are perfect for shadier sites. 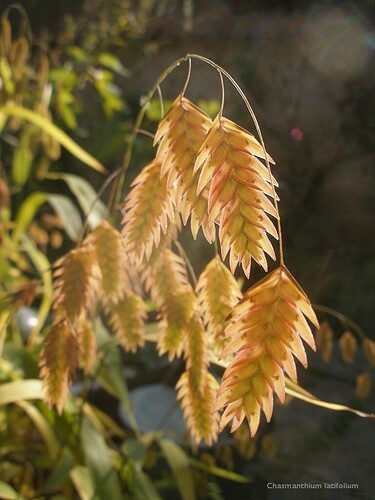 Chasmanthium latifolium, or Indian wood oats, is a favorite. It has large, arching seedheads and it can reseed readily. This makes it particularly well-suited for areas that don’t get a lot of maintenance but that you want to look attractive. It will form a fairly dense cover when established, reducing the need to weed or mulch. Elymus hystrix, or Bottlebrush grass, is another choice for woodland areas though it can also handle sunny spots too if they are not too dry. The graceful seed heads do resemble bottle-brushes. Elymus virginicus, or Virginia wild rye, is related. Another important group of plants are not technically grasses but do resemble them. Plants in the genus Carex are sedges, and they are incredibly useful in Roland Park landscapes. Several popular sedges do well in dry shade, where little else will grow (especially turf grass). In contrast to the true grasses (above), which are tall enough to be planted as an accent planting or in the core of a perennial border, the sedges tend to be very low-growing. They tend to be used as an edging plant or as a ground cover. In fact, many homeowners are replacing lawns with Carex appalachica and Carex pensylvanica as a no-mow alternative to maintained turf. Both have a fine texture, similar to grass, but never grow taller than 4-5”. Carex glaucodea, or blue wood sedge, has a wider leave and is a good native alternative to liriope. Finally, Carex stricta, or tussock sedge, is perfectly suited to wet areas or spots that flood intermittently. If you have low spot in you yard, Carex stricta might be a good choice. Our native grasses can be used as ornamental accents or as backdrops to perennial beds. Increasingly, homeowners are replacing sections of their yard with meadow gardens: a mix of native grasses and perennials to act as a place for butterflies and birds to congregate. If you have children or grandchildren, you may also find that they love hanging out in such a meadow because there is so much more going on than a bare turf lawn. The meadow garden has another virtue, in that they require cutting only once a year!